Investing is a cornerstone of wealth building. No, we are not going to win the lottery, and most of us are not going to inherit a fortune from our parents. So we need to jump into the stock market and the earlier we start investing, the better because time is what really matters when it comes to building our nest eggs. But investing can be intimidating. Even the vocabulary around it sounds like a foreign language, mutual funds, market price, share price, robo-advisor. Don’t worry. Investing is not as complicated as it seems to the uninitiated. 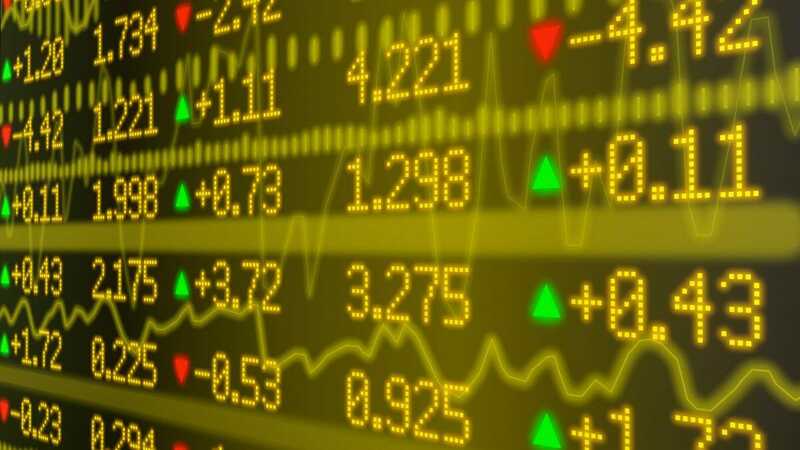 In fact, by the time you finish reading this, you will have all of the knowledge you need to start buying stocks, one way or another. So if you’re not sure how to buy stocks, our beginners guide to start investing is just for you. If you’re skeptical about the benefits of investing, here are some fun facts for you. Between 1928-2013, a broad index of U.S. stocks increased 2,000 fold. However, during the same period, they lost at least 20% of their value. This proves the key is long-term investing. The single best three year period for stock owners happened during the Great Depression. The second best was the three years starting in 2009 when the world economy was in collapse. If you bought 10 shares of Apple at the IPO in 1980, it would have cost you $220. As of November 2018, after four stock splits and almost 30 years, it would be worth $124,443.20. That is a 56,465.09% return on your $220 investment. Convinced? Good! Let’s start investing. We know you’re nervous, so we’re going to start you off on easy mode. All you need to start investing on these platforms is a dollar and an internet connection. You don’t need a brokerage account, you don’t need to research individual stocks, and you don’t need an expensive financial advisor. The main advantage of robo-advisors are the low fees. Most charge an annual flat fee of 0.2% to 0.5% of a client’s total account balance. Compared to the typical rate of 1% to 2% charged by a human, financial planner. And as we’ve shown you, fees matter. Sure 1% doesn’t sound like much, but when we’re talking about tens or hundreds of thousands of dollars over decades, it is a lot. Fees can eat up as much as 24% of your investments! The portfolios built by most robo advisors contain mutual funds or exchange-traded funds (ETFs), not individual stocks. Robo advisors use a passive investment strategy that is based on modern portfolio theory research. What that basically means for those using robo-advisors is that your portfolio will be created according to the level of risk you’re willing to take. 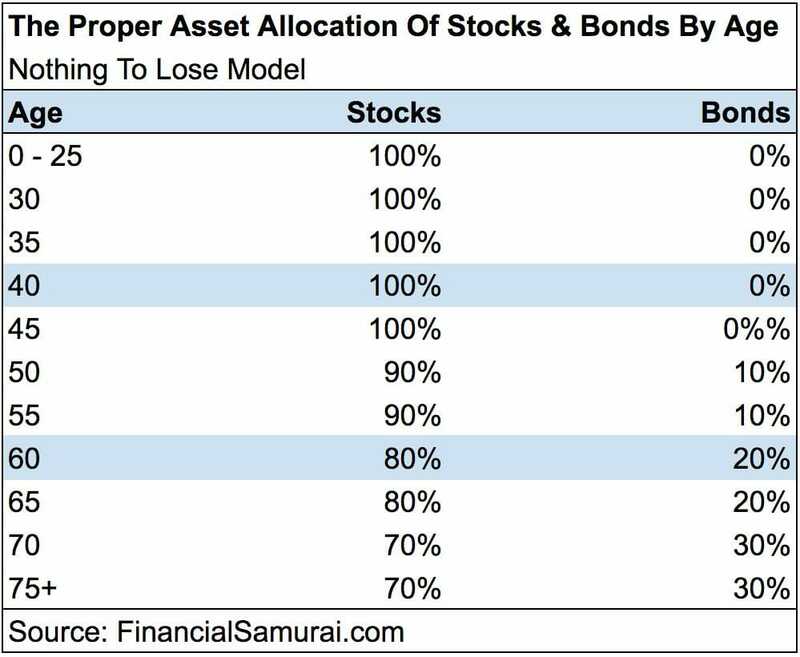 The more risk, the more heavily weighted your portfolio will be towards stocks rather than bonds. Stocks are riskier than bonds, but the payoff is higher. And by investing in a diverse pool of assets, you lower your risk while simultaneously stabilizing your returns over the long term. How much risk should you take? Generally, the younger you are, the more risk you can tolerate because your money has many years to ride out the ups and downs of the market. There is a good rule of thumb illustrated in this chart. These are the robo-advisors we like. Acorns lets you invest your spare change. To set up your Acorns account, link your debit card and as many credit cards as you like. Every time you buy something on a linked card, Acorns rounds up to the nearest dollar. If you buy a coffee for $2.25, then 75 cents will be set aside for investing. You can automate this, so every purchase is rounded up or go through each of your purchases yourself and choosing which roundups to transfer. You can also invest a lump sum or set up recurring deposits. There is a cash back program too. Acorns has partnered with over 250 companies including Barnes & Noble, Expedia, and Lyft, that will give you cash back when you shop with them using a linked card. Each time your account reaches $5, the money will be taken from your checking account and invested into one of Acorns five portfolios which have automatic rebalancing and dividend reinvestment. When you create your account, Acorns will ask a few simple questions and based on your answers, recommend one of these portfolios but you’re free to choose for yourself. Acorns charges a flat $1 per month fee for accounts under $5,000. Accounts over $5,000 pay 0.24% and over $10,000 pay 0.12%. Even if you just use the round-up feature, Acorns will take you from a non-investor to a regular investor, and that’s a significant first step. Ah, the grand dame! Betterment deserves a special place in every personal finance nerds heart because it was the first robo-advisor, the company that brought investing to us filthy masses who can’t afford personal stockbrokers. When you create your Betterment account, you’ll answer a few questions about your investing goals. Based on your answers Betterment will recommend an asset allocation, your split between stocks and bonds. You use the slider to set your chosen allocation. You’ll link your checking account to your Betterment account. You can transfer money immediately or set up automatic transfers; there is no minimum deposit. The money in your account will buy exchange-traded funds (ETFs) based on your chosen asset allocation. Any dividends are automatically reinvested for you, and your portfolio is rebalanced and tax-loss harvested. For those with accounts under $100,000, the fee is 0.25% of assets under management annually. Investors will have access to financial advisors with Betterment’s in-app messenger feature. For those with $100,000 or more, the fee is 0.40% and includes unlimited phone access to financial advisors. Most of us have specific financial goals: short-term goals like saving for a vacation, medium-term goals like buying a home, and long-term goals like retirement. And while any investing platform can help you save for those goals, Wealthfront can help guide you in reaching them. 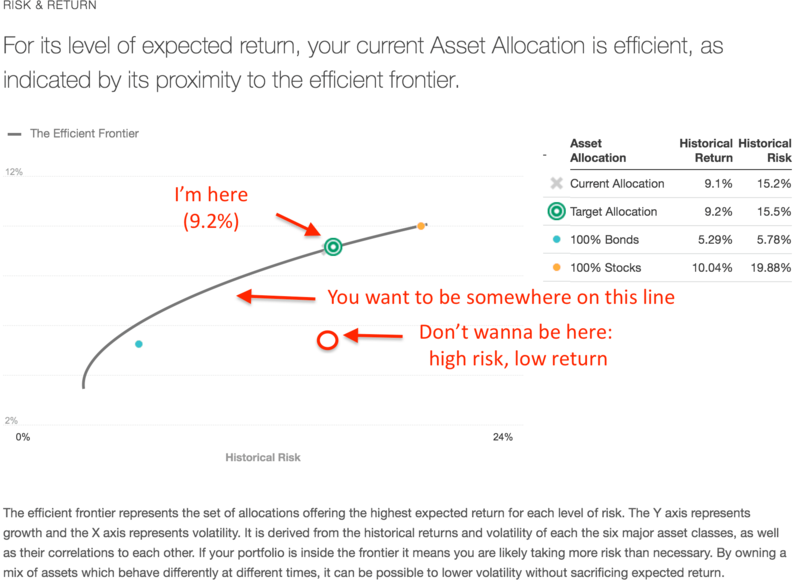 To set up your Wealthfront account, you’ll answer ten questions designed to determine your risk tolerance and based on that to set your asset allocation. Wealthfront has a minimum deposit of $500 to open your account. Your money will be invested in ETF’s based on Modern Portfolio Theory, and your allocation remains constant with automatic rebalancing. Wealthfront also offers tax-loss harvesting. Wealthfront portfolios contain eleven asset classes including natural resources and real estate which makes them the most diversified among our three robo advisors. 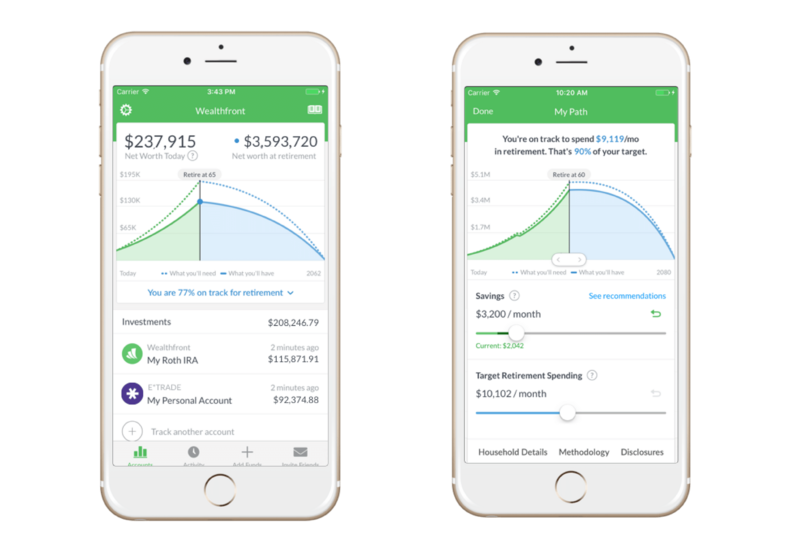 Path is the program Wealthfront uses to help users achieve their financial goals. You connect all of your bank and investment accounts (if you have any others) and based on your goals and those accounts, and creates personalized financial advice. 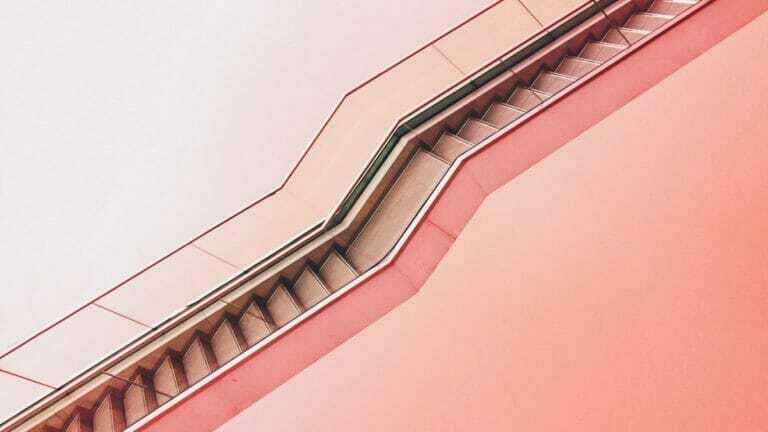 Path can show you how your spending and saving habits are impacting your goals and offer advice that will get you back on track if you’re not on the right Path (see what they did there?). The fee to invest through Wealthfront is 0.25% on assets under management. When you invest through a robo-advisor, you don’t get to select individual stocks. But what if there is a particular company that you really want to invest in like Amazon or Apple? Buying stocks isn’t the issue, picking stocks, however, is a bit more difficult. An excellent place to start is only to buy stocks in companies whose products or services you know and understand. Choose a few companies that you’re interested in and whose products or services you use regularly. Start researching each one. Where should you do your research and what do you need to know? Your first thought might be the Wall Street Journal. But if you’re still new to investing, reading that paper can seem like reading a foreign language. A resource we like is Simply Wall Street. The site turns complex data into easy to understand infographics. Value: Value is based on future cash flow and its price relative to the stock market. Future: The expected performance in the next 1-3 years, based on estimates from up to 50 analysts. Past: The earnings performance over the previous five years. Health: A company’s financial health and their level of debt. Income: The current dividend yield, its volatility, and sustainability. Management: How long has the board been serving, is the CEO grossly overcompensated, has there been any insider trading? Discounted Cash Flow: The amount of money a company is projected to earn in the future and what the value of that money is today. It’s a way to account for inflation. This is a great resource for those new to buying individual stocks and seasoned investors. Once you’ve done your due diligence and are ready to buy, it’s easier than you think. You can buy stocks online when you open a brokerage account. 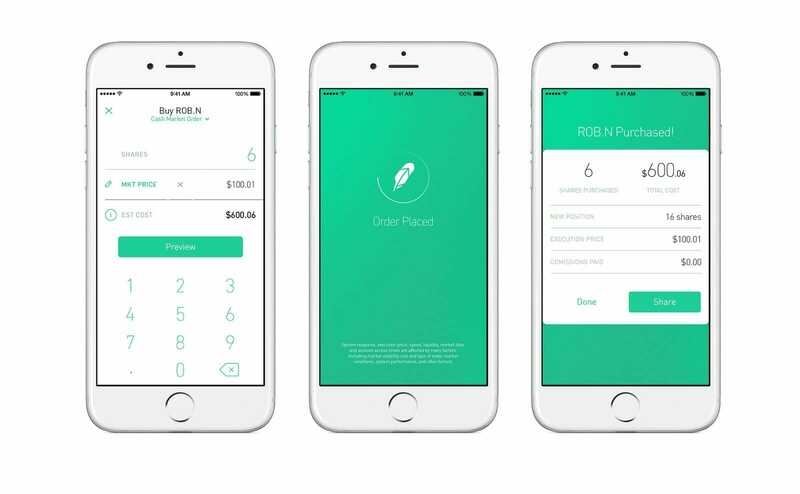 Robinhood is an app that lets you make free trades, no fees, and no commissions! It only takes a few minutes to open a new account and link your bank account. There is no minimum deposit, but of course, you have to have enough money to actually start buying stocks. You can set up auto deposits or fund your account manually. You’ll be asked a few questions about your investing goals, but there are no pre-set portfolios. You can look up information on stocks, but it’s all trading information basics, not information on company fundamentals. You can get that information at Simply Wall Street as we discussed above. Type in the symbol of the company you want to buy stock in, and you’ll see the stock price. Click the Buy button, and you’ll be sent to the order screen. Type in the shares you want and the price. If you don’t want a market order (A request to buy or sell a stock ASAP at the best available price), you tap Market and choose a limit order (A request to buy or sell a stock only at a specific price or better.). Review the order and swipe to submit. Congratulations! You just made a stock purchase! Robinhood doesn’t offer some of the bells and whistles that other online brokers provide, but they have everything a new investor needs. TD Ameritrade has the bells and whistles Robinhood lacks. The trades aren’t free, they’re $6.95 which isn’t the most low-cost option, but TD Ameritrade doesn’t have a minimum account balance while many of their competitors do. To open a new account, you’ll answer some questions about what you expect to primarily do (buy and hold, actively trade stocks, etc. ), and then you’ll connect a bank account. This is our favorite thing about TD Ameritrade. The site allows you to use a stock simulator. You get fake money to practice trading! Once you create an account, go to the Trade tab and under the drop down choose “Start swimming today. Slide the toggle beneath your username to paperMoney and log in. You will be able to access all of the data available to practice your trading strategy. 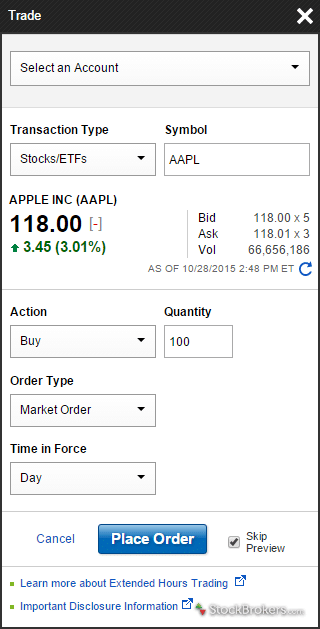 Click Trade Stocks & ETFs from the Buy/Sell from the main menu. Go to the Action menu and choose Buy. Enter the number of shares you want to buy and the symbol. Choose an order type, set a price, and choose time-in-force. Finally, click Review order to confirm your trade and Place order to complete it. TD Ameritrade is a terrific gateway for new investors. Practice makes perfect, so the option to use simulated trading is terrific and what you need to learn to become a better investor is available on the platform too. Fidelity slots into a comfortable spot between Robinhood and TD Ameritrade. It has a low fee of $4.95 per trade while providing lots of easy to access research and an easy to use platform. You’ll provide and verify basic information to open a new account including how many trades you expect to make per year, and you’ll link your bank account. There is no minimum to open an account with Fidelity. Where Fidelity really shines is the research available to users. They use research from more than 20 providers which is a lot for even a professional stock broker to wade through but Fidelity provides an Equity Summary Score on the stock quotes page which is a consolidation of a stock’s ratings based on all of that research. When you’re ready to buy, just use the dropdowns to fill in the online order. You’ll be able to preview the order before placing it. Once placed, you’ll see an order confirmation screen which you can print or view online after the order is placed. Once your order is placed, an order confirmation screen which contains your order number and trade details will be displayed. You can print this confirmation for your records, or view it online after your order is placed. You can also receive a trade confirmation via email. Fidelity may seem like the way your grandfather bought stocks, but they have done a lot to innovate and make the platform attractive to younger and beginning investors. If you’ve been with LMM for a while, you know that we advocate a lot for robo advisors. We do that because every day new people find us who don’t know anything about personal finance but despite that, we want them to start investing right away because there is no substitute for time and the longer they wait, the more money they leave on the table. And robo advisors are a pretty foolproof way for beginners to start building wealth. If you’re new to all this, stick with the robo advisors we recommended. But there is absolutely room in everyone’s life for buying individual stocks. Does it take a little more know-how and research? Yes, it does. Should a total beginner take the $10,000 sitting in their savings account and start buying stocks on their own? No, they should not. But there is nothing wrong with using a portion of your discretionary income to buy individual stocks. If you’re going to use Robinhood because they offer free trades, be sure to use Simply Wall Street to do your research. If you want an all in one that allows you to buy stocks and get great data in the same place, TD Ameritrade and Fidelity will be good fits for you. What we want everyone to understand is that investing is for everyone and no matter your level, there is a platform for you. Now get investing!